It's time for another party MadPea style. In honor of Valentines day we decided to have a Anti-Valentine Day party!! The love potion that was brewed was a little to potent and it has created monsters. We will have a best in costume contest. The theme of your costume has to be anti valentine. We want to see you as zombies, bloody and bruised bodies. Become death, dark and eerie. Anything that protest valentines day. Prizes for the contest will go as follows; 1st prize - 2000L, 2nd prize - 1000L, 3rd prize - 500L. 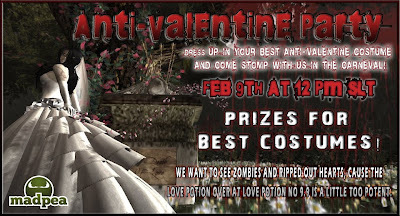 While your waiting for the party to start if you haven't started our newest hunt, Love Potion No. 9.9, you should get over to Hoshi island and do it. Mix the potion to bring true love. The hud is only 50L and lots of awesome prizes for you to get in the end. So if you love love or hate it or are in the middle come and celebrate with us. 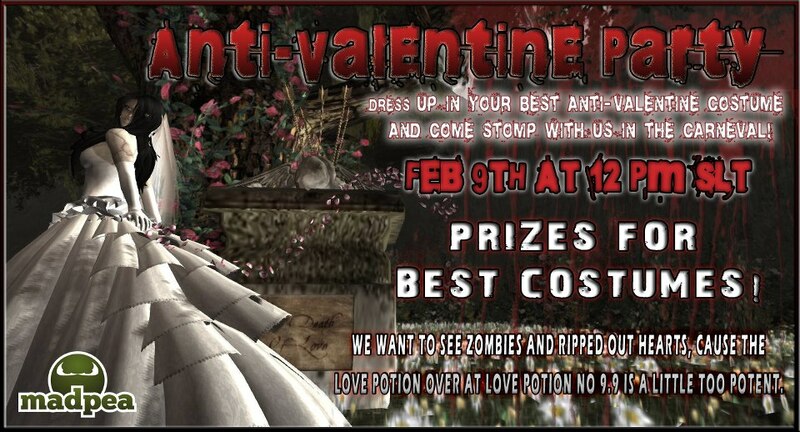 Join us on February 9th at 12 pm slt in the Carneval for the best MadPea party yet. You know your mad and you want to do your madness MadPea style.